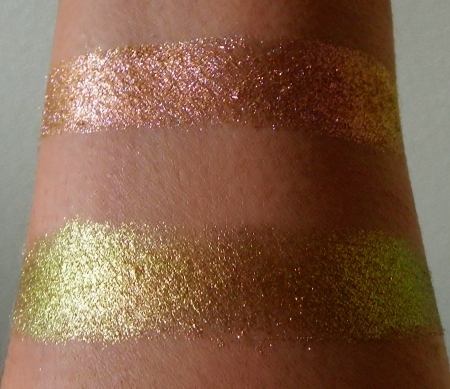 Bold rosy and bronze sparkle on a sheer base turns lime green at an angle or closer to light. Despite the appearance in product photos of a dark brown base hue, this shadow is transparent as shown on the right, comprised mainly of color-changing sparkle, and can easily be applied over other colors (try this one over purple or emerald). A sticky base is highly recommended. 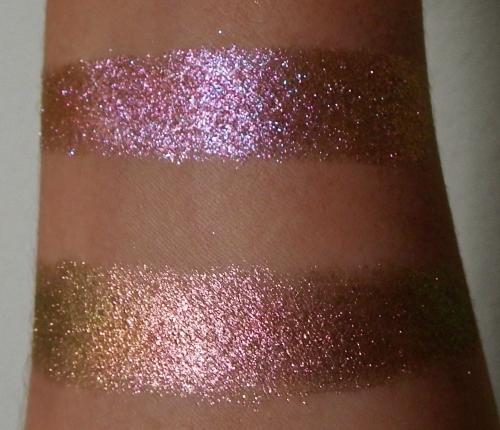 Bottom swatch, first shown away from direct light, then angled toward it. Applied over diluted Pixie Epoxy. These shadows have stronger color changes without depending on an opaque base hue, making them stunning alone or over many other colors. Most can also be easily mixed with or applied over lip gloss. Initial color noted as held at arm's length, then brought closer to indoor lighting or viewed at a different angle.